Tonight’s Bones opened on a man in a parking garage, which in Hollywood might as well be a murder house. No other setting makes it so obvious that somebody’s going to die. Sure enough, he explodes before the opening credits. 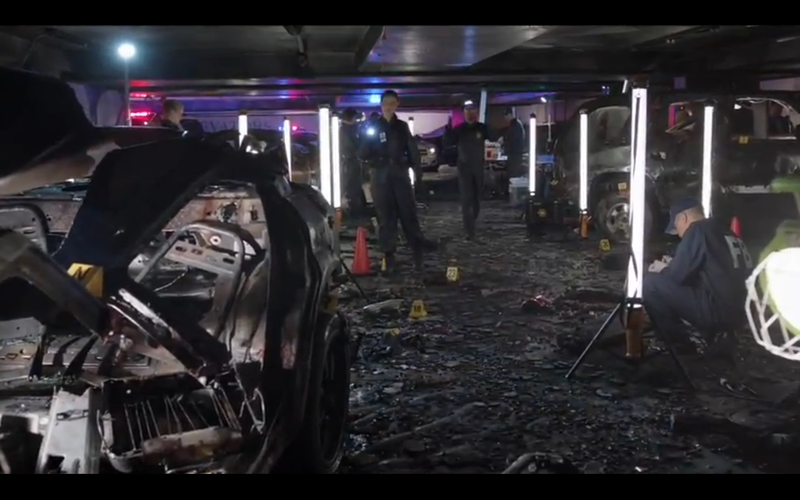 Hollywood really wants us to fear parking garages. What did we ever do to deserve this? Let me recline on a comfy therapist couch and break down my paranoia. I suppose it all started with a woman in a red button-down, sitting alone in a restaurant. That’s the first scene of Alias I ever saw. She paid for her meal and headed for the parking garage, where hit men in suits were waiting for her. The resulting fight scene was the original Sydney Bristow Badass Moment, and she lived to kick more bad guys in the face, but the psychological damage was done, and I learned a lesson: a parking garage is a good place for people to aim guns at your head. Alias also taught me that a parking garage is a great place to hit people with cars, crash cars, chase cars, lock someone in the trunk of your car, hang on to the top of a car while engaging in a shooting match through the roof, torture someone by tying him to your roof, blow things up, make shady deals, beat up your stalker, kick Quentin Tarantino in the face, hold someone at gunpoint, and cry. Sydney Bristow turns out to be just one in a long traumatized lineage. Much of Monk revolves around the fact that his wife was killed in a parking garage, the target of a car bomb. When murderers discredit Monk’s assistant by making her look insane, it’s no coincidence that they try to freak her out by sending a man after her in a parking garage. It’s where a serial killer captures Brennan and Hodgins on Bones; it’s where goldfish die on Seinfeld; it’s where men get blown up and the ceilings are low and the lights flicker and everyone looks like they want to hurt you. And it’s where I’ll never go if I can help it. You and me both, Booth. So did I miss any creepy parking garage moments? And what are your TV-induced phobias? Join me on the couch. It’s safe here.